Preheat the grill. 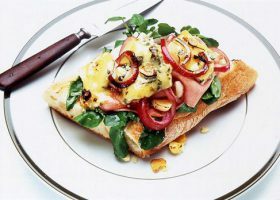 Cut Ciabatta in half lengthways and drizzle with olive oil, grill on both sides. Top with watercress, followed by the ham and sliced stilton. Fry onion rings and garlic until soft and place on top of the cheese along with some black pepper. Place under the hot grill until cheese melts. Serve immediately.